Stage one of my VIP commission. 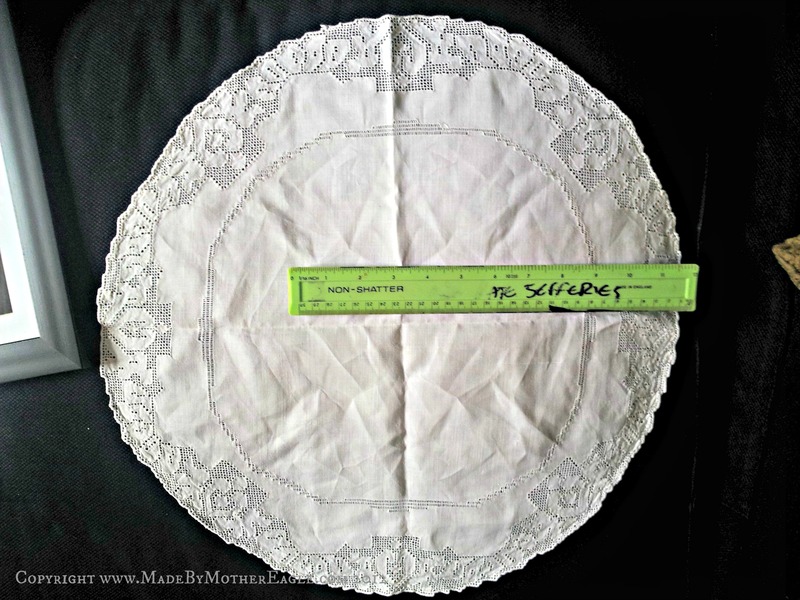 So we knew we wanted to work on one of my vintage doilies, and chose this large circular Irish linen one. 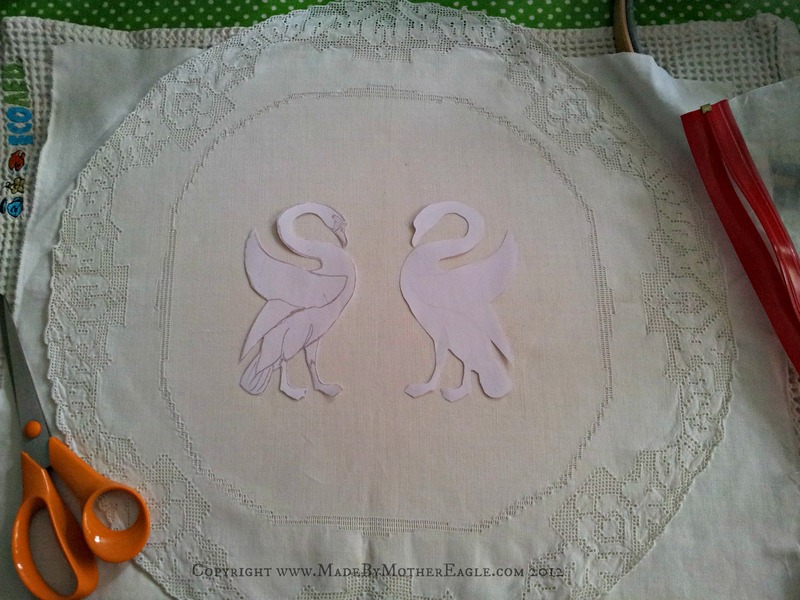 I had initially in mind an oval shape as the composition of two swans will naturally sit landscape, but then I noticed this lovely sort of heart shape motif in the lace cutwork, and I thought it would be so nice as an echo to the swans curving necks. 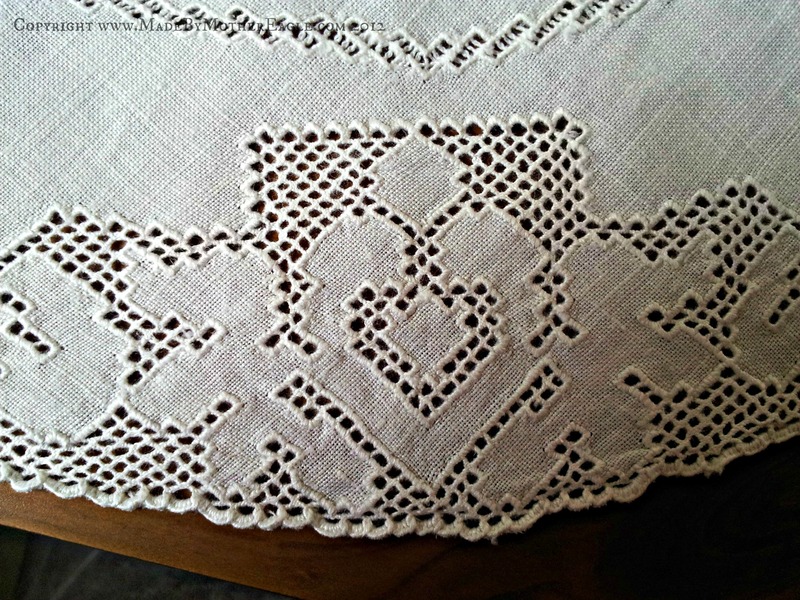 The doily is great quality, there was a tiny little hole which I mended, but other than that nothing but one or two tiny ‘age spots’. I started work on the pattern. 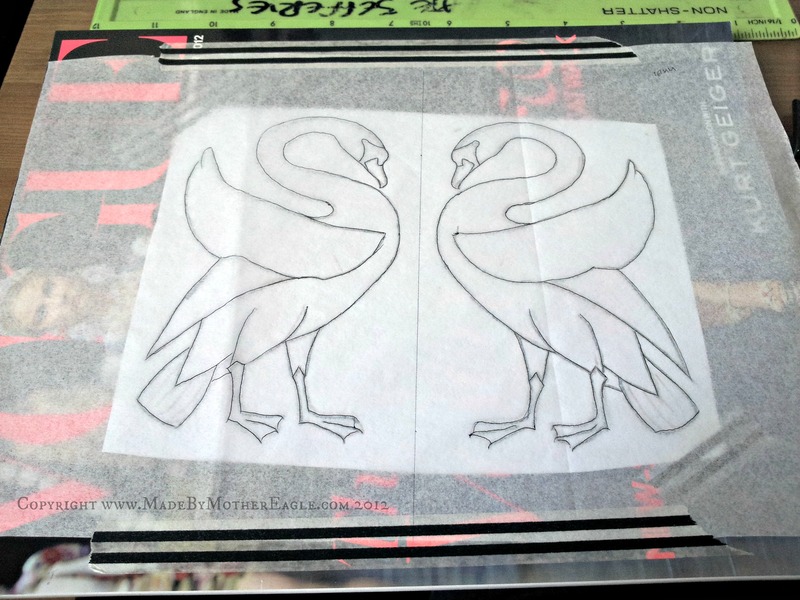 My client wanted the two swans as in the inspiration illustration, but I played around with the shape of the bodies, the size of the heads and the curve of the necks. I tend to do this both on my computer in a paint programme, and with paper and scissors, cutting out and playing around, scanning etc. I had in mind that I wanted the heads to be large enough that I could work in the details like highlights in the eyes and changing texture in the feathers. Once I was happy I cut them out and agreed on size and placement. Now I make a confession. I’m really nervous in preparing this piece. Let me explain; once I get my needle threaded and start sewing away I’ll be happy. But handling these old textiles (this one is about 1940s and hand-made) makes me jittery – I have one go to get it right and I can’t afford mistakes – it’s not like I have another identical antique linen waiting in the wings in case of mishaps. So whereas I can pretty much hoop-and-go with the jewellery miniatures, art pieces have to have the foundations laid first. Luckily linen has great longevity due to the length of the fibres, so first up I pressed it with a hot iron, along with a piece of soft cotton; it is important with this piece to back the linen with something to stabilise the linen to allow heavy embroidery as it is more open weave. 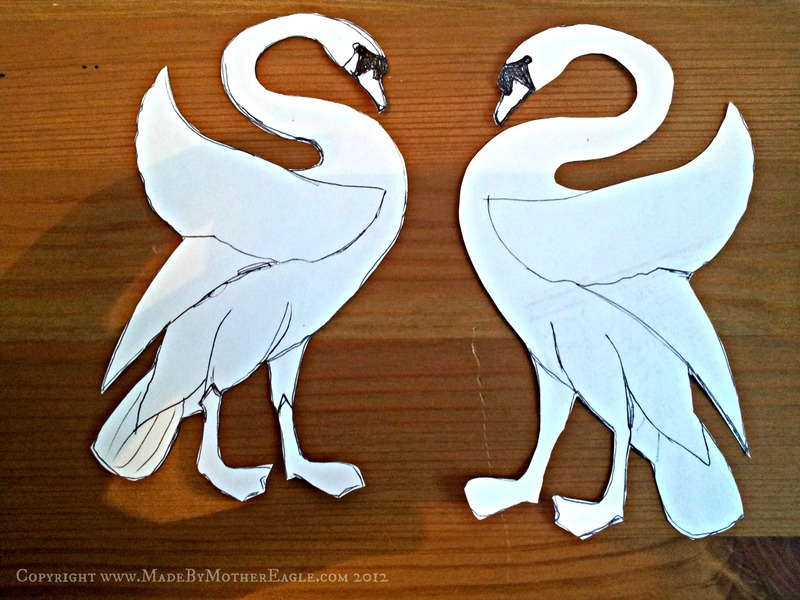 Also with this being two stylised swans, symmetry is important, so I tacked on dissecting lines to show me dead centre. 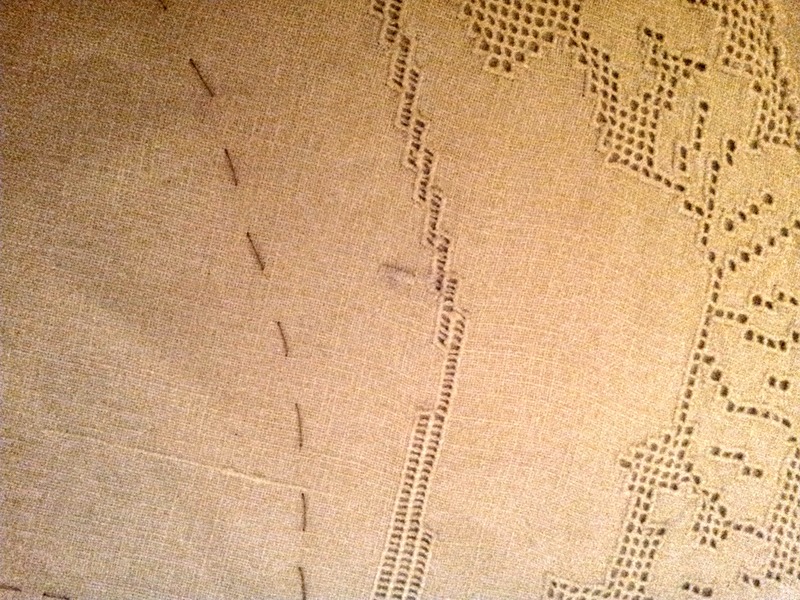 Then I pinned the backing fabric to the ground fabric and tacked the two together, then pressed them. With this stage it was also important to line up the grain of the two fabrics to make sure there would be no tension pulling problems. 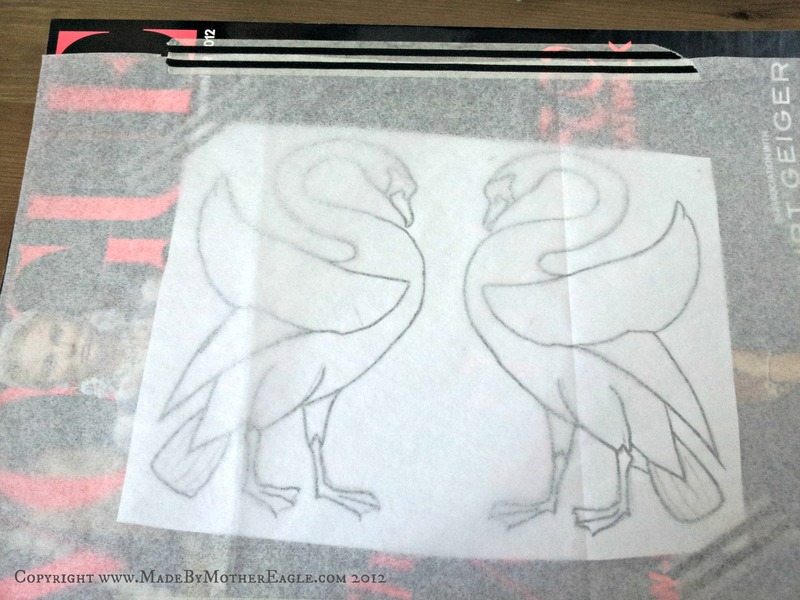 Then, laying a piece of good quality tissue paper over the secured line drawing, I traced around the main important lines. This then has to be pinned in the exact place on the doily. To assist with this I have measured the centre line through the swans and will line this up with the stitched line on the doily. Which I will show you tomorrow! good grief what a lot of work, but it will be worth it in the end. Thanks to you VIP for letting you share the process, really interesting stuff. Nice to see the enormous amount of work that goes into these pieces.